First, if I tried to keep up with all of the new music and artists that are out on the road with established artists, I think my head would burst. To say the least, that would be a job in itself; just to know a couple of facts or points about these bands and their names would wear me out! I could read every publication, scroll through all of the outlets that cover music, and talk to other people about who they’re listening to or who’s trending and I think I still wouldn’t know who they all are. I guess my point is that I feel like it’s a waste of time for me to go search new bands out on my own. This is why new bands should have publicists because these folks are trained to go find the new fans that will appreciate and dig their music (PSA from Cherri: if you’re a new band or you’ve been around for a while and are fixing – that’s Texan speak for getting ready to – to be out on the road, you MUST have a publicist!). Tonight, opening up for PANIC! AT THE DISCO were two artists that I wasn’t familiar with. MAX FROST and HAYLEY KIYOKO. In fact, I had never heard of either of them until MAX FROST’s publicist got in touch with my Editor about covering him. (And there’s why the publicist is so important for newer artists or even opening acts on a tour like this!) MAX FROST seems to be a one man band so to speak. Not a DJ, although he did play some tracks at the beginning of his set. Despite the stage almost swallowing him and his equipment and thankfully there were cameras filming for the jumbo LED screens on the walls, I have to give him some stellar props for getting up there alone – and doing his thing in front of all those people. 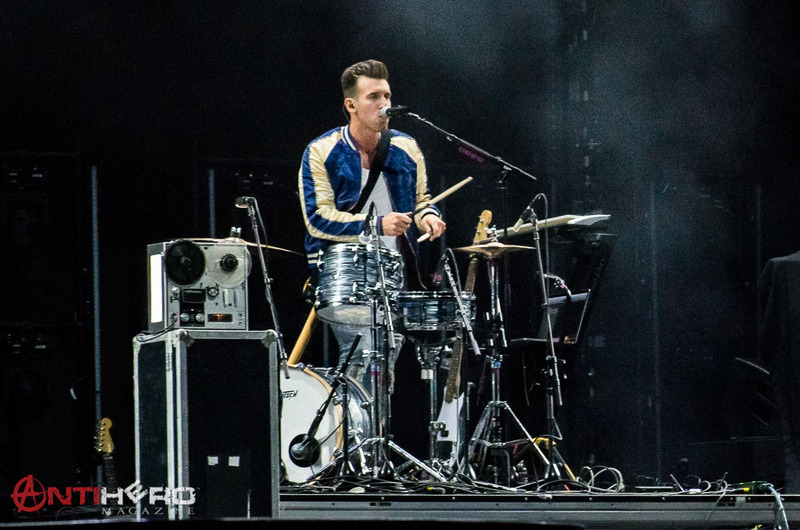 Although I wasn’t sure what was going to happen and during the first three songs I saw as I was shooting his set, MAX FROST has a swanky voice that wooed all of the fans there to see PANIC! AT THE DISCO. Unbeknownst to me, Lesbian Jesus was main support for PANIC! AT THE DISCO – well, that’s the name her fans have bestowed upon her. 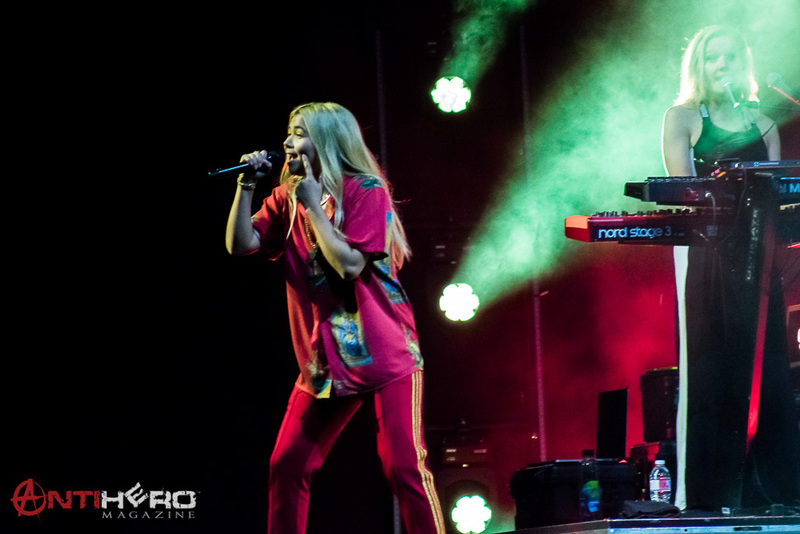 HAYLEY KIYOKO is her real name and some have reported KIYOKO has been dubbed the Lesbian Jesus for her efforts in resurrecting pop music. But if you ask her core fans why the name has stuck, they may tell you a different story. But, alas my Lovelies, that’s not why we are here. If you wanna drill into the whole story about HAYLEY KIYOKO, go for it because she is undoubtedly brimming with talent. Her set tonight was on point and she has that spark that can ignite the audience on the other side of the arena. 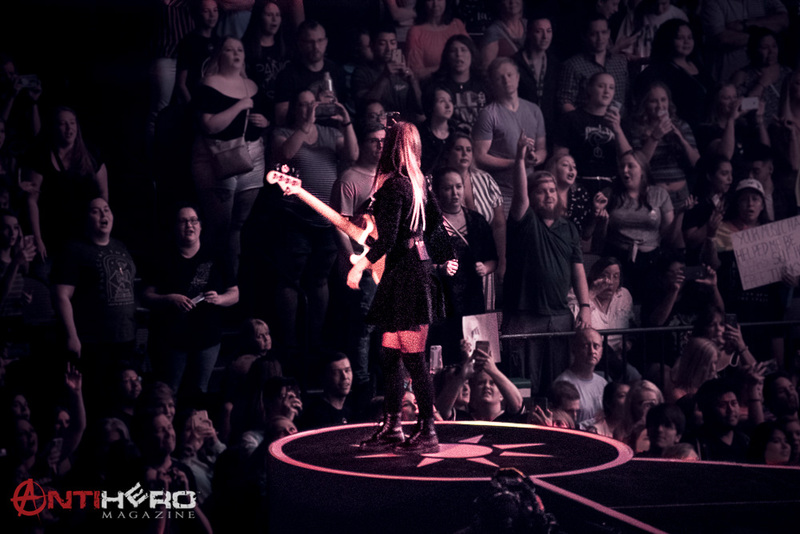 I loved that she worked both sides of the stage and although I knew we were in a massive arena if she could look everyone in the eye, she would. 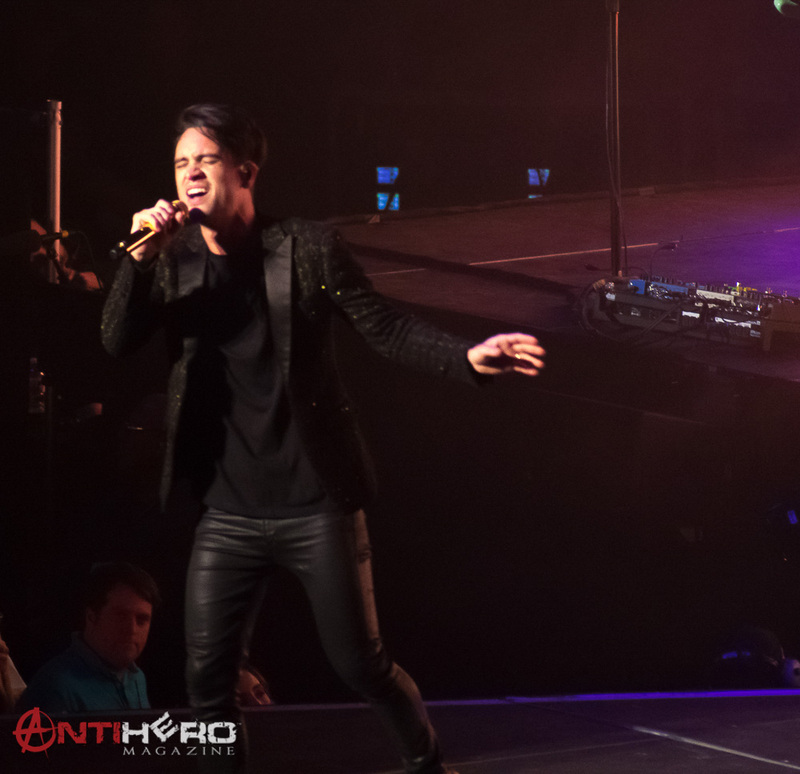 Backed by a full band, her music was catchy and fun and set us up for BRANDON URIE and PANIC! AT THE DISCO to take the stage. Look, y’all – can you even say the band’s name without almost yelling the word PANIC because of the ! exclamation mark? I can’t. I literally say PANIC louder than the rest of the At The Disco part. I mean that’s what it’s there for, to incite a reactive tone, right? Right after Pray For The Wicked came out, the 6th full-length record for the band since their formation in 2004, I looked up all the bands that had an exclamation point in their name. There’s more than I thought and there are also several songs with the powerful punctuation point in the title. I’ve always dug the name of this band just for that reason. I think it’s just a cool attention to detail that makes me happy. As a wordsmith, I totally appreciate the usage. Now, I could write an entire piece on the misuse of punctuation in music – but…I won’t. Hyperfocusing on punctuation isn’t interesting to many but people like me. 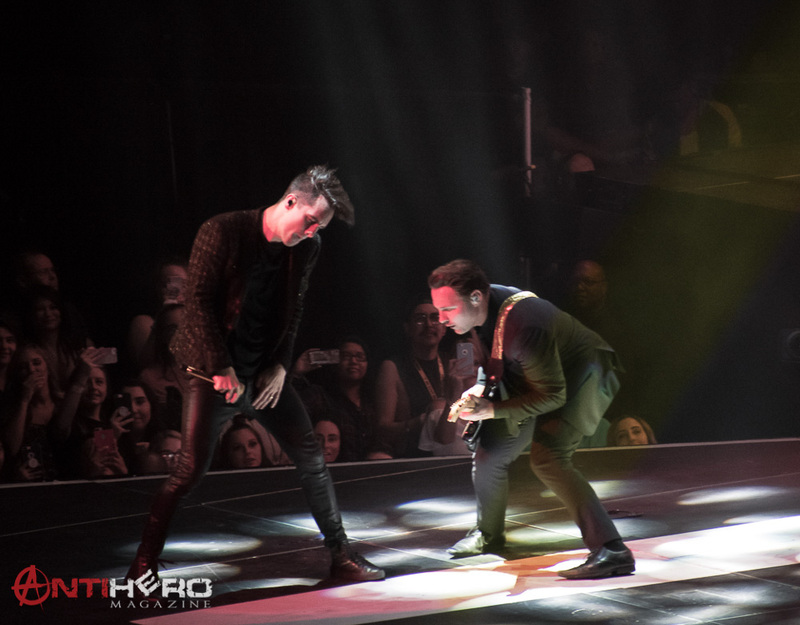 I will, however, tell you about tonight’s freaking arena show with PANIC! AT THE DISCO. In support of Pray For The Wicked’s release in July, PANIC! 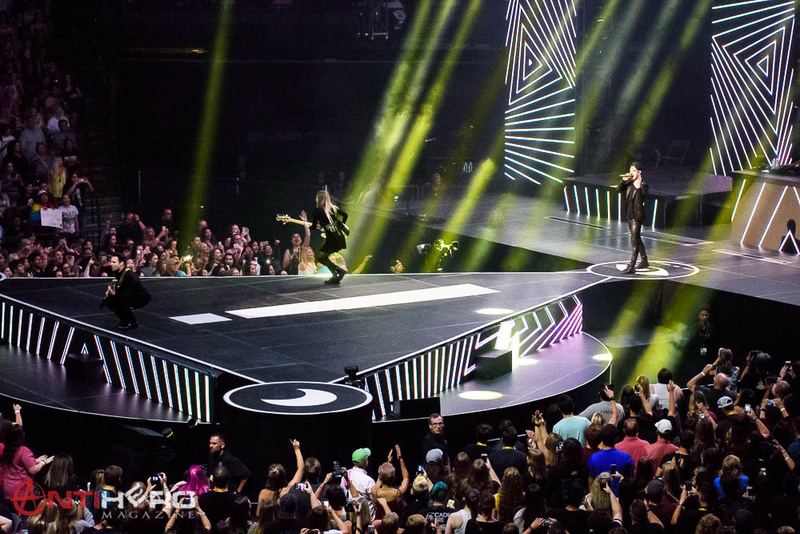 AT THE DISCO is rolling across select cities and Dallas was one of them. Lucky for us, right? This show SOLD OUT, every seat from the floor to the ceiling had a bootie in it and in true Texas fashion, this audience was ready for BRANDON URIE to step on that stage. And boy, did he ever step onstage! Keep reading, Lovelies! As the countdown clock on the massive screen behind the band’s set up ticked down from 9 minutes, you could feel the waves of energy build with every second that flipped. At the 3, 2, 1 mark pandamonium exploded and everyone went nuts! It was like these crazed fans had not seen the band for 9 years, although the band was in Allen (a suburb north of Dallas proper) in 2016. I loved that after the clock went to 00:00 everyone immediately expected the onslaught to begin, however, there was a lull that left everyone perplexed. Purple stage lights slowly glowed to reveal the drums and just about the time when the thought started to enter your mind of, “WTH?? Why isn’t it starting?” KABLAM! Out shoots BRANDON from a hole in the floor, poised like some maniacal bat, the stage lit up like a supernova and the song “(F__k A) Silver Lining” bellowed as he landed on both feet, literally like a freaking superhero! WHAT. Just. Happened? Dude. I could not contain myself as I tried to juggle my camera, phone, and standby camera because I missed BRANDON’s grand entrance onto the stage. And to be honest, I don’t know what happened for the next 9 minutes as the first three songs just flew by as quick as a flash of lightning strikes the earth. I just danced a little and snapped the pictures from the perch where the photographers were cooped. I can say: It. Was. Fabulous. At least the first 3 songs that I experienced. This performance was high speed, high energy, and in some places, high pitched. BRANDON has a four-octave range and with a tenor lyrical voice, so just the way he sings is amazingly unique. 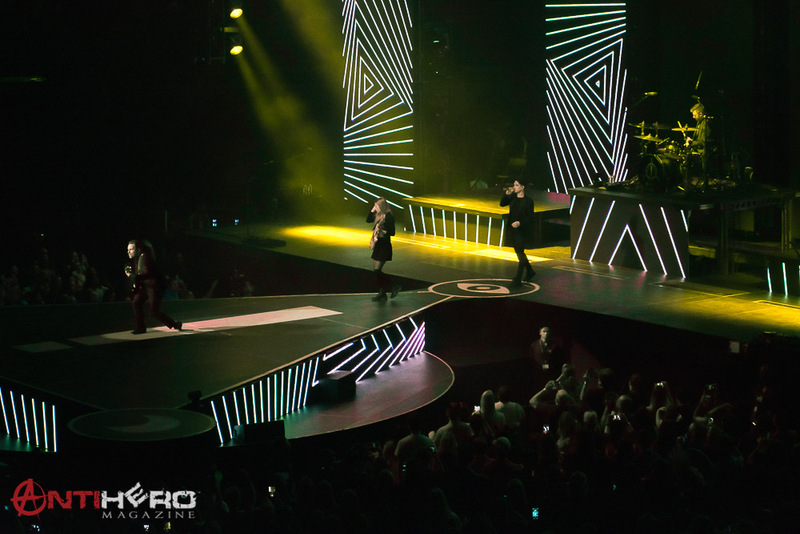 I loved the simplistic stage, where the band members were set up and I loved, loved, loved the horns that were on stage right and the strings on stage left! 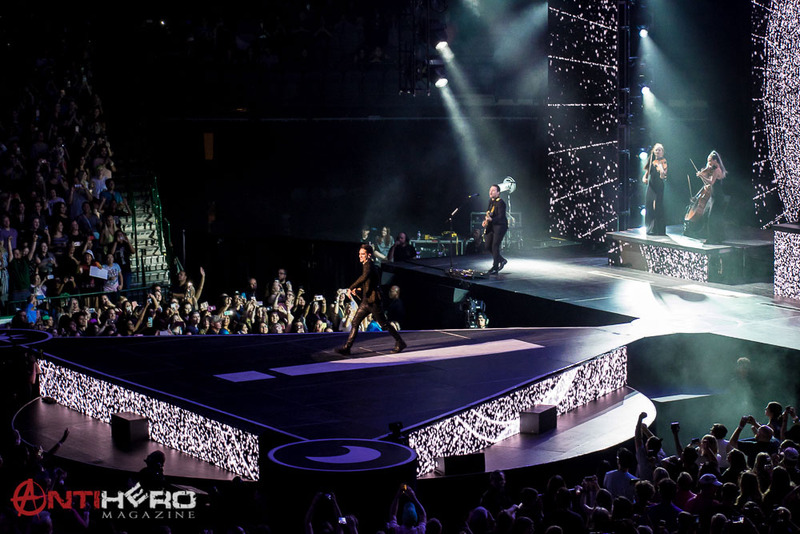 It’s always rad to see other instruments incorporated in such a big touring production like PANIC! AT THE DISCO has. If you have a chance to see this show, do it. It doesn’t matter how big of a fan you are. Even if you’ve just heard of the band and dig that one song on the radio, GO. If you’re the biggest fan and just love everything about PANIC! AT THE DISCO and know every word from all six records – GO. If you’re a parent and your kid wants to go – take them! 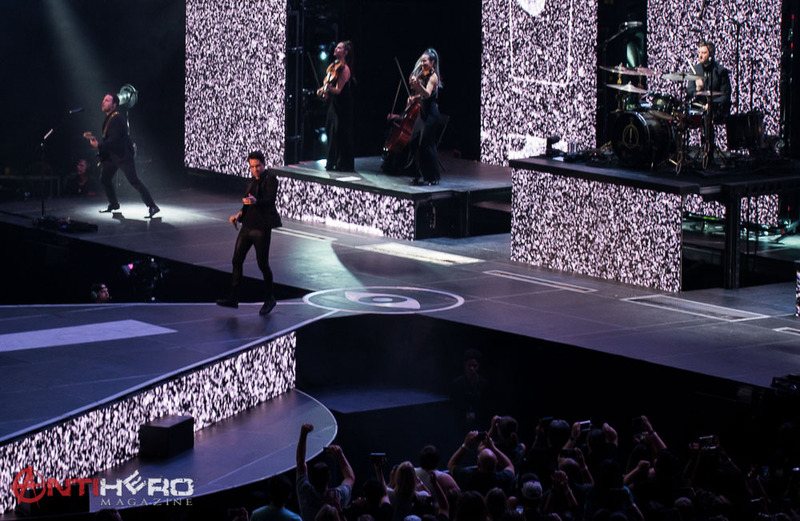 Experience this show because it’s one full of pageantry, explosive pyro, smoke, killer lights and graphics on LED screens that are all over the set and display elements that tie into the music and songs perfectly. But don’t just for these bells and whistles; go because you’ll get to experience a rock show that features a truly talented artist and the group of musicians that play for him on tour. 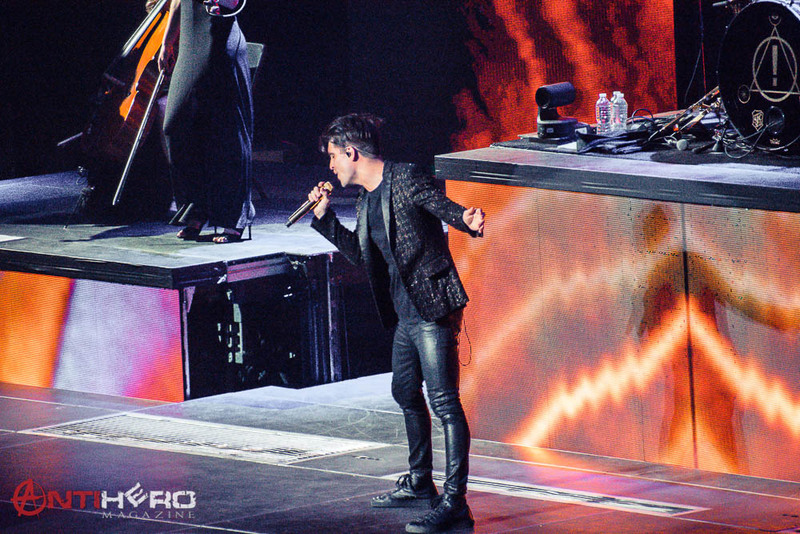 BRANDON URIE does not in anyway disappoint. The US Tour continues until August 18th and picks back up in Europe for several appearances. Don’t worry my Pretties, if you missed this summer’s tour, just wait until January of 2019. 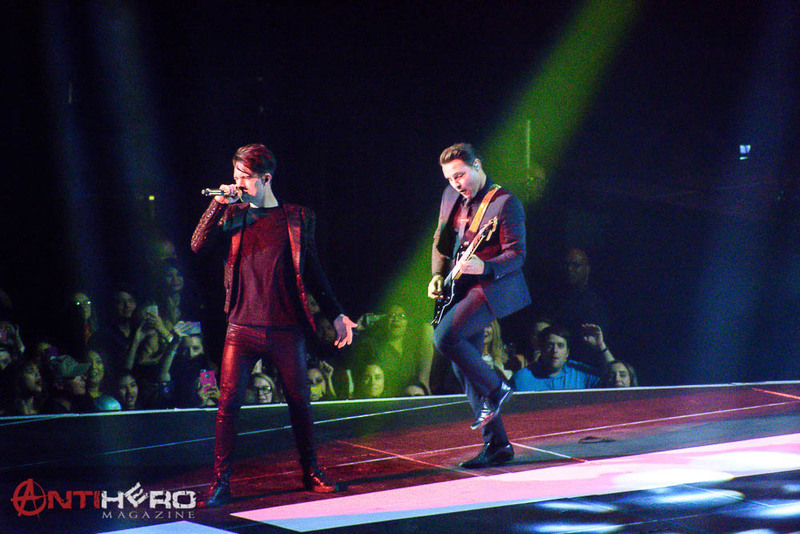 BRANDON and PANIC! AT DISCO returns for more domestic dates! Oh, and let me just say if you are in one of these cities that the tour is stopping in, don’t wait to get tickets. It will sell out! You can find tickets here (www.panicatthedisco.com ) and of course, you can follow the band on all of the band’s social media platforms!